December 22, 2009 — From pencil sketches to crayon drawings, vague concepts to professional-looking layouts, the 85 designs NASA received for a patch to symbolize the end of its space shuttle program varied as widely as the past and present employees who created them. That was exactly what the contest organizers had hoped would happen. "We had a really wide variety of people who participated. We were really happy to see that," stated Debbie Byerly, who led the patch contest as technical assistant to shuttle program manager John Shannon. The entries, which were accepted between Oct. 15 and Dec. 1, came from multiple NASA centers spread across the nation, and from artists who ranged in profession from technician to astronaut. For John Shannon though, as the leader of the program, it was what was in the designs that really amazed him. "I was stunned," he told collectSPACE. "What is really amazing to me, is how much emotion people have put in [to the patches], how much they care about the program and they really thought long and hard about what should be in this patch to be representative or thematic of what this program has meant to them and their kids and their parents and just everybody. I've just been amazed." That passion, said Shannon, is important especially now, as the shuttle program is set to face what he believes will be its biggest challenge: safely shutting down. Click on a patch design to enlarge and enter the gallery. It would be easy to look at a patch contest and consider it only as a means of extending NASA's public appearance but for Shannon, the focus was solely on motivating those inside the program. "Public outreach, we are all about that, we really want to do that, but we're looking for ways to build up the spirits of the team in this really difficult time," he explained. "It is a little bit a bleak time right now. We're doing layoffs right now, we've got another big layoff coming in February. We're going to lose 2,000 people here [at Johnson Space Center] in ten months, we're going to lose 4,000 people at [Kennedy Space Center] in ten months, but this [patch contest] is kind of a fun, uplifting thing to try to reflect back and think about what we have done. It gives you that encouragement to finish up strong." As currently planned and funded, NASA has five missions remaining, all scheduled to launch next year, to complete the International Space Station (ISS). After the last flight, the 134th of the shuttle, lands, the agency will ground its orbiter fleet, and unless otherwise directed by Congress and the President, refocus its manned space program on designing and building a new vehicle to take astronauts beyond low Earth orbit, back to the Moon and elsewhere. 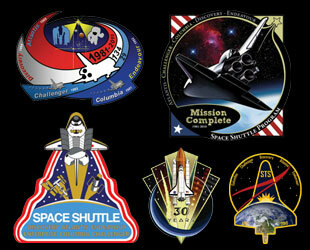 First though, NASA needs to safely fly out the remaining shuttle missions, which presents a new type of challenge. "I think these five flights are going to be the most difficult flights we've ever flown," admitted Shannon, "because of the distractions and potential loss of focus. We are doing everything in our power to make sure that we keep the team really focused amongst all the distractions of what is going on [around them]." "Because we are losing a lot of our coworkers, a lot of the hardware and training, and things that we've built up over 30 years... it could be a very difficult environment if you let it be. So we're really concentrating on doing things for the team that is executing and producing the hardware to go fly the flights." "Little things that say, 'we're all a big team here' and we're trying to pull together to finish up really strong, build a lot of esprit de corps and camaraderie among the team," he said. Those 'little things' include a hall of fame wall at Johnson Space Center in Houston that replaced managers' profiles with team members' from around the agency; bookmarks being flown on the space shuttle with team group photos printed on their backs; the planned distribution of 150,000 Spaceflight Awareness awards to program workers; and the current patch contest, which will fly the winning art on one of the last shuttle flights. "We were trying to think of things we could do that could help morale and would be kind of fun and uplifting, but we also wanted to reach out to everybody to let them know that we understand that if you worked here 30 years ago or if you flew the shuttle in the '89-'90 timeframe that we care about what you think and we wanted them to provide their input into this too," said Byerly of the impetus behind the patch contest. Even Shannon, who is serving as a judge, was tempted to enter. "I kind of thought about it. I kind of thought about working on it with my kids and then I saw some of the patches coming in through the door and thought, 'Nah, we're done.' We'll probably still do it with the kids just for fun, but no I did not enter as it would not be fair as a judge." Joining Shannon at the judges' table are Mike Moses, the shuttle's integration manager at Kennedy Space Center in Florida; Steve Cash, manager of the shuttle's propulsion office at Marshall Space Flight Center in Alabama; Leroy Cain, Shannon's deputy for the shuttle program; and John Casper, associate manager of the shuttle program and a former astronaut who flew four times aboard the shuttle. Together, they will pick 15 out of the 85 patch designs to be posted to an internal NASA website for a vote among the employees from Jan. 11 through Jan. 29. "We're struggling with coming up with just 15 to put on the web and I think it will be a lot of fun to watch the totals," said Shannon. "The lobbying to be in the top 15 has already started, but from years of being a chili cook-off judge, I've built up my immunities," he joked. "We purposely did not put the names or where the [artists] are from on the artwork for the judging or for the people's choice because we did not want to influence the judges," added Byerly. Ultimately, the decision will be left to the judges. "The leadership of the program will pick the final patch. It may be the one that is the people's choice but then again, maybe not, but we'll end up flying both," said Shannon. According to Byerly, they hope to have the judges make their selection sometime in February so they can manifest the artwork and get it flown before the shuttle retires. "I know that Johnson Space Center would like to produce t-shirts, coffee mugs, coasters and all kinds of things with the [winning] patch on it," she said. "We're working with the other centers, with their exchange programs, to see if they would like to do the same." "We'll make a big deal out of it," assured Shannon, "but we're not sure yet what that big deal will be."